The 47th meeting of the National Council was held on 13.4.2019 at Rail Bhawan, New Delhi, under the Chairmanship of Shri P.K.Sinha, Cabinet Secretary. It was held after the most inordinate delay i.e. after the lapse of nine years that the National Council meeting was convened. 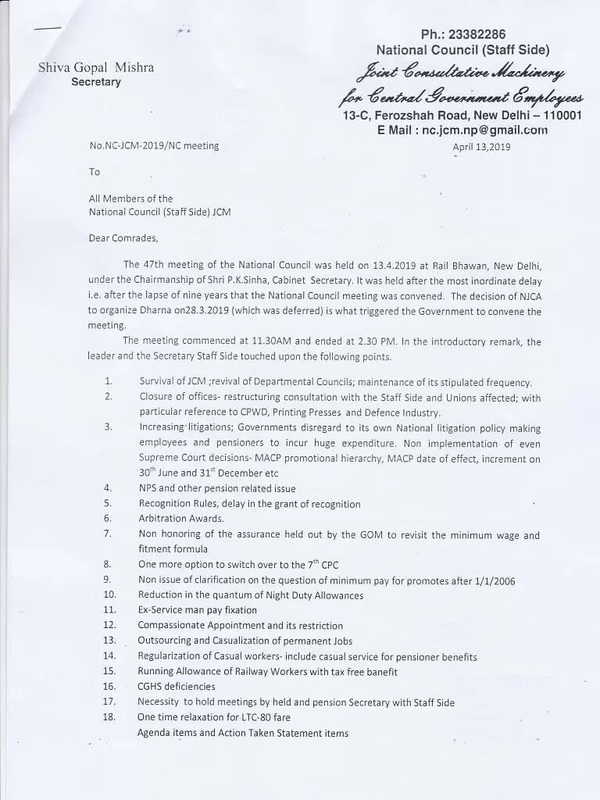 The decision of NJCA to organize Dharna on 28.3.2019 (which was deferred) is what triggered the Government to convene the meeting. The meeting commenced at 11.30AM and ended at 2.30 PM. In the introductory remark, the leader and the Secretary Staff Side touched upon the following points. Survival of JCM; revival of Departmental Councils; maintenance of its stipulated frequency. Closure of offices- restructuring consultation with the Staff Side and Unions affected; with particular reference to CPWD, Printing Presses and Defence Industry.